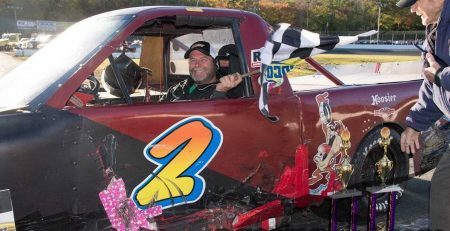 WATERFORD — After just missing the 2017 New London-Waterford Speedbowl SK Modified championship by the length of a bread crumb, Kyle James came up with a new strategy for 2018. He came close. 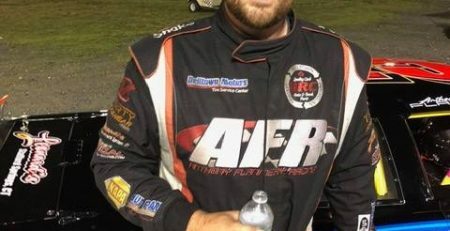 The Ashaway, R.I. driver won eight races to capture his first Speedbowl title by nine points over Todd Owen, who finished second. James took the point lead by winning the first SK race of the year and was a dominant factor for the rest of the season. James will be receiving his championship recognition Saturday, Feb. 9 at the annual “Stars of the Speedbowl” Banquet at the Mystic Marriott. Tickets, are priced at $60 and ticket forms can be obtained at the Speedbowl web site, ww.speedbowlct.com. “It’s tough to put into words,” said James, talking about his championship season. “Wins are cool, but you have 20 chances to get a win during the season. But you have only one chance to win a championship. James started the season with two wins, but there were troubles waiting around the corner. But there was a silver lining. Once the engine was repaired, James’ car was as lethal as ever. 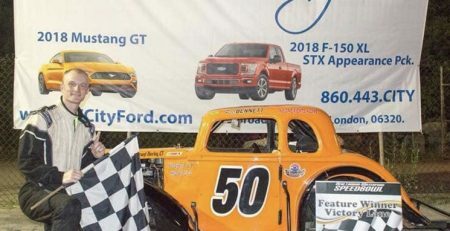 He proved it at the 80-lap Blastoff on June 30 when he started fifth and needed only 13 laps to go from fifth to first, lapping all but three cars. It was the 2018 season’s most dominant performance. He needed a great car, because Todd Owen of Somers spent most of the season surgically attached to his back bumper. Owen won five races, but it wasn’t enough to derail the James express. Because of competitors such as Owen, James changed his game plan in 2018. “We get points for heat racing, so everyone is racing hard trying to get those five extra points,” James said. “Strategy wise, we really tried to win heat races this year,” James said. 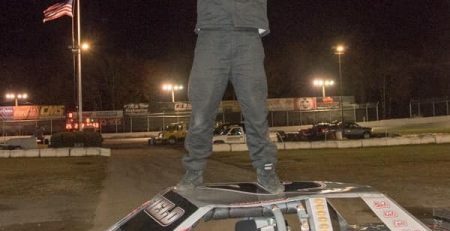 James clinched the title with a heat race win at the Finale, making a surprise attack on Tim Jordan on the final lap to put a padlock on the championship. It’s a good thing he did. James was involved in a wreck early in the finale and finished 23rd. But the championship already was in a lock box. 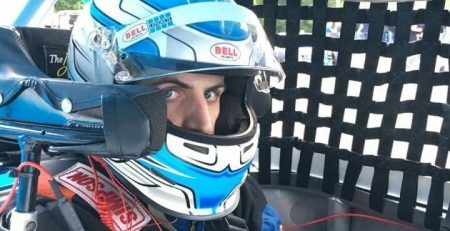 Last season he was nipped at the wire by Keith Rocco in a controversial finish. James and his team made sure there as no replay. 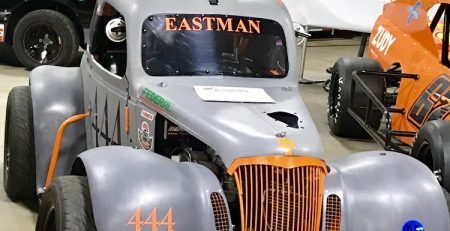 James sponsors include Jammin’ 107.7, U.S. Country 99.5, The Logistics Company, Rhode Island Harvesting, Ceravolo’s Auto, Switz Realty, Spicer’s Marina, Judy Halleran Re-Max, Dan’s Pizza Place, Housemaster of Connecticut, Dunleavy’s Truck and Trailer Repair and Petit Racing Engines. James crew includes his dad Dan James, who has been instrumental in Kyle’s career, Jeff, Joe, Bob, Billy, Skip, Rick, Bob Lord, Kyle’s’ girlfriend Christen and the youngest member of the team Ellie. 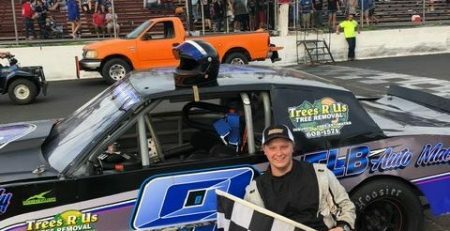 James 2019 plans include defending his Speedbowl title. And it all starts with a celebration on Feb. 9. Kyle James didn’t win every race in 2018. But he won enough races to capture a championship. He wasn’t perfect in 2018 — but he was close.